Olimex has been working on an open source hardware Olimex A64 laptop for a little over a year, and the company has now complete thed hardware design of their TERES I laptop, and are working on finalizing the software design before accepting orders for 225 Euros for TERES-A64-BLACK and TERES-A64-WHITE models. TERES-014-Screw-Set with 42 pieces of different kind of screws. TERES-PCB1-A64 motherboard based on Allwinner A64 processor. You’re not quite done yet, as you still have to flash the firmware/operating system – either Android or Linux – on a micro SD, in order to boot the laptop. Software and hardware documentation is available in github. The software currently includes ARM trusted firmware, u-boot, the Linux kernel and device tree files with more common soon. 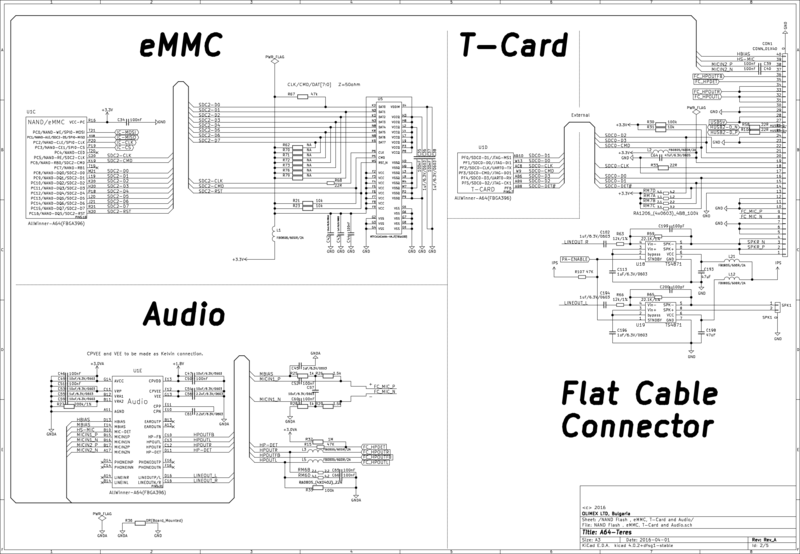 The hardware has been designed with KiCAD open source EDA software, and if you want to change or improve one of the boards in the design, you can do so, as the source schematics and PCB layout are there for everyone to study and/or modify. If you don’t want to modify anything, but would like to have access to spare parts, you will be able to buy them instead. 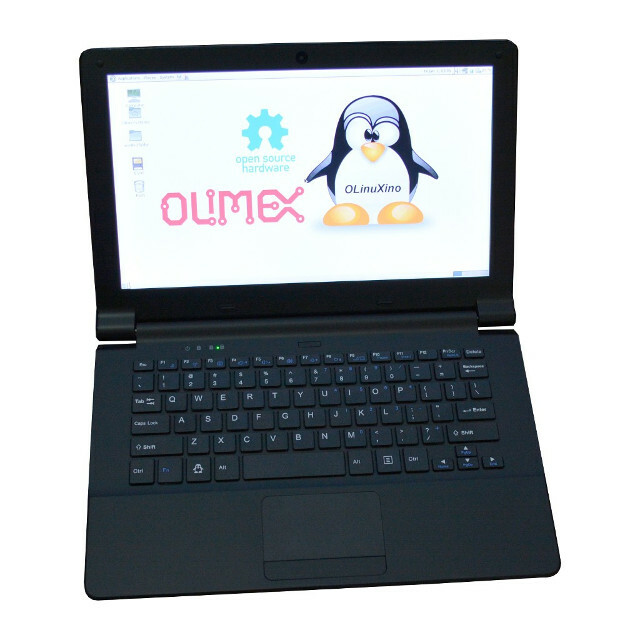 If you go FOSDEM 2017, you’ll have opportunity to check out the laptop yourself since Olimex will be there. Only 4GB eMMC… that’s really not useful for anything these days. So Teres is here at last, good. The RAM and eMMC are small, of course, but it should not be a problem to at least double them on the same reference design, right? 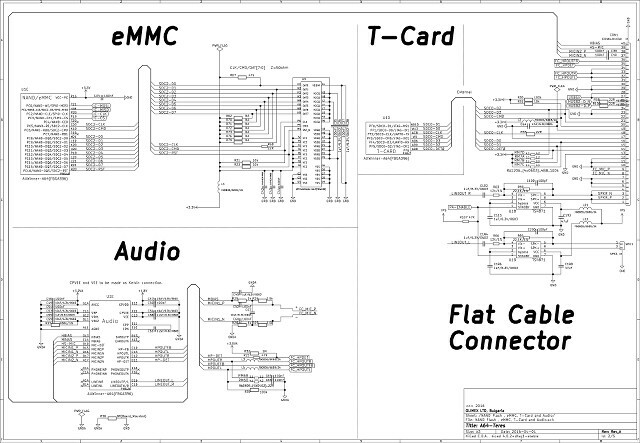 Actually, it would be nice if Olimex took orders for 2GB RAM and 8GB (and up) eMMC TERES-PCB1 boards. Perhaps they already do? Since Friendlyelec and Jide both have A64 products it is a shame these conpanies could not work together on software! $230, for such a low-end spec? I don’t understand that, when there is the PINEBOOK, with much better specs, available for $100! If this Olimex is at most $150 it will be a good present for parents to give to kids. Judging by specs is IMO the biggest mistake one can make with this device category. Specs neither tell you whether keyboard and/or display is usable or not nor whether the device is waste after 13 months of light use due to broken hinges and the other well known ‘Buy cheap, Buy twice’ issues. For linux desktop use, I think these days 2G Ram (and no swap) is the minimum to be comfortable. About eMMC speed, recently got a OPi+2se and my feeling (just a feeling) is that Armbian runs a little bit faster on a Sandisk Ultra card than on the emmc. But seriously: what’s the use case for a laptop? One of my neighbours always laughs at me since I’m only buying PowerBooks and now MacBook Pro while he’s buying ‘as cheap as possible’ laptops he has to replace almost yearly (paying more over the years than me). The displays are that bad that I don’t want to look into for more than a few minutes and all neighbours around can hear when he watches movies since he adjusts volume to the max to compensate for the annoying fan constantly running then. And for the stuff I could do with A64 laptops I already found a solution years ago: https://www.facebook.com/photo.php?fbid=3539404528711&set=a.2564719242188.2118796.1380356705 (interesting experiment to leave the laptop at home and work 2 weeks solely on iPad, most stuff including remote server administration went well but some stuff not). Anyways that price range belongs to x86 cpu’s. I love arm but it simply does not want to make a competent hardware at 100-150 price range. I bet a 14″ laptop with 4GB RAM, 32GB eMMC and a cpu like an helio X20 for that price can be done without any problem but they prefer to continue making dozens of atom or celeron ones for a little more, which is understandable but thus arm will have no market for laptops, ever. It’s targeted for hardware enthusiasts rather then general consumers. As for an ARM laptop, you should be hearing something soon regarding the Snapdragon 835. I hope they will offer more motherboards in the future. Something like z3735f/z8300 with 2GB of ram and 8-16GB of flash would make much more sense than A64. And these atom chips are dirt cheap (tablets and settop boxes sell for less than 90$) so it shouldn’t raise the price all that much. Any word on the availability of pinebook ? Just a shame business competiion stops all these companies working together on having software with drivers for their products where possible. Just like Android makes TV boxes，phones, tablets sales easier. ‘Do-It-Yourself Open Source Hardware and Software Laptop with ARM64 and x86 processors’ was the description of TERES I from day 1. You’ll also find a somewhat outdated post (comments thread) by searching for x86 in Olimex’ blog that discusses pros/cons of x86 support back then (from the ‘open source’ perspective of course, no market/marketing BS). Needs twice as much SDRAM and 4X more Flash. I can sort of understand a high price due to low volumes, but not that high.